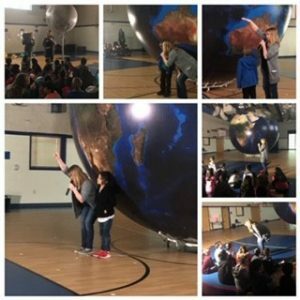 Olmos Elementary Hosts Orbit Earth Expo! 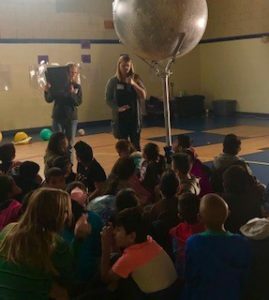 SAN ANTONIO, TEXAS – Olmos Elementary had their second SparkPoint program this school year! 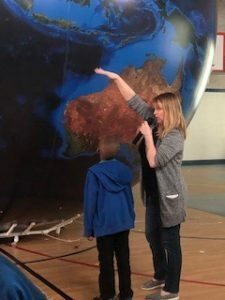 We had a blast bringing the BIg Canyon Balloon out last fall, and were so excited to share our astronomy program, Orbit Earth Expo, with your students as well! Olmos Elementary is always to welcoming – we love to visit! The students showed awesome behavior, even with a surprise fire drill during a class! All of the students participated and were eager to volunteer. What a great way to experience rotation and revolution, solar and lunar eclipses, tides, seasons, and more! We heard some great questions during the day and were super impressed when a first grader knew that the rotation of our earth creates the pattern of our days and our nights – wow! It was also fantastic to hear the 3rd graders already using the vocabulary “rotation” instead of spinning or turning – you guys are on top of it! Thanks for sharing a fun day with us, Olmos!